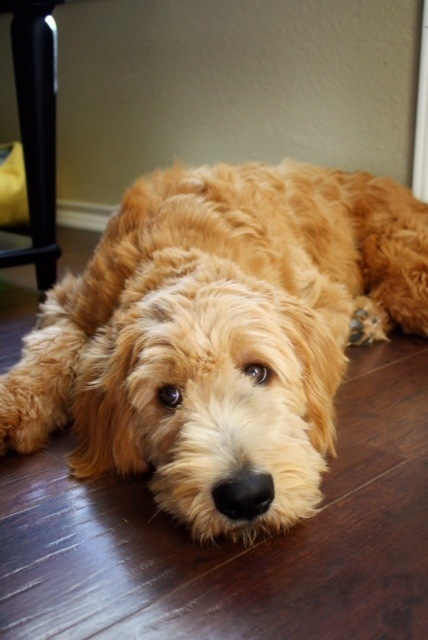 It is our firm belief that nutrition is as important to the life of your Safari Doodle puppy as the good genetics of our health certified parent dogs. As health conscious dog breeders we have fed or are familiar with nearly every food on the market. These years of experience led us to feed a world- renowned supplement, NuVet Plus. Any food you choose to feed is incomplete by itself, and supplements or vitamins are necessary. 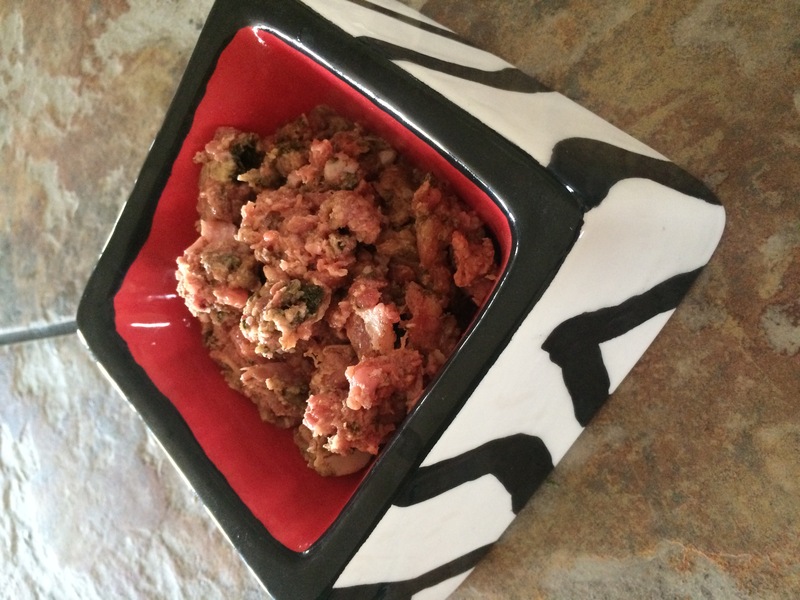 We are big fans of raw meat/veggie blend diet for our dogs. BARF® is about feeding dogs and cats properly. The aim of BARF® is to maximize the health, longevity, and reproductive capacity of pets, and by so doing, minimize the need for veterinary intervention. How do you feed a dog properly? You feed him the diet he was designed to eat… A Biologically Appropriate Raw Food diet. The BARF Diet® is simple in philosophy and construction. It looks at the diet of a wild wolf/dog, and mimics that type of feeding regiment using available whole raw foodstuffs, although the diet may be enhanced with various supplements. In the case of the cat, which is an obligate carnivore and a hunter, the biologically appropriate diet is based largely upon animal derived foods. Basically, whatever nutrition can be derived from a whole fresh raw carcass – in its entirety – constitutes a biologically appropriate diet. In the case of the dog, which is an omnivore, a hunter, and a scavenger, the diet can be based on a wider range of whole raw foods of both animal and plant origin. Both species rely on bones as a major part of their diet for a variety of reasons including teeth cleaning, jaw exercise, and complete nutrition. The philosophy behind using BARF® is that the diet a dog or cat was designed by God to eat is the best way to feed him. This is the hypothesis accepted by most modern zoos or any zoologist concerned with preserving a species of an endangered animal. It is not the theory endorsed by most pet food companies or the people they train – and that includes, unfortunately – many vets. If you want to feed your dog BARF®, it means not feeding your dog cooked and or processed food. That is, not feeding your dog a diet based on cooked grains, no matter how persuasive the advertising. Artificial grain based dog foods cause innumerable health problems. They are not what your dog/wolf was designed by God to eat. A biologically appropriate diet for a dog is one that consists of raw whole foods similar to those eaten by the dogs’ wild ancestors. The food fed must contain the same balance and type of ingredients as consumed by those wild ancestors. This food will include such things as muscle meat, bone, fat, organ meat, and vegetable materials and any other “foods” that will mimic what those wild ancestors ate. Please note that modern dogs of any breed are not only capable of eating the food of their wild ancestors, but actually require it for maximum health. This is because their basic physiology has changed very little with domestication despite obvious and dramatic changes in their current physical appearance and mindset. The BARF Diet® must, from a practical point of view, use food that is readily available. BARF® feeders do not have to go hunting or send their dogs out to hunt. That is why I said BARF® must mimic, not duplicate the original diet of dogs. This is an important distinction. The BARF® feeder will mimic as closely as possible rather than duplicate the natural diet of the dog. We are not trying to return our dogs to nature. It is impossible to feed any domestic animal its natural diet, let alone allow it to live under natural conditions. The natural diet and natural conditions under which the ancestors or wild cousins of our dogs live include grave dangers such as lack of shelter, starvation, attack by potential food, attack by other predators and the non use of medical intervention. In other words, natural diets and natural conditions can be deadly! They are not what we want for our pets. What we want for our dogs is a diet and an environment that maximizes health. That means a Biologically Appropriate Diet rather than a natural diet. This is my favorite use of the term BARF® – Biologically Appropriate Raw Food. 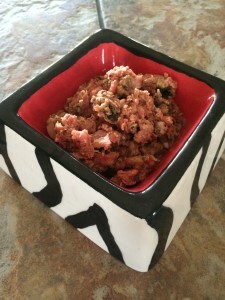 BARF® – Biologically Appropriate Raw Food. Optimum nutrition is important for the overall wellbeing and longevity of your puppy. Complete nutrition through food and supplements is what gives your puppy the building blocks for bone and joint health, healthy skin and hair, proper growth, and more. We have our own established feeding and supplement protocol that we use, and we highly suggest you follow a similar protocol for the best care for your new puppy. Both the dog food and the supplement we feed are only sold through distributors. We have supplied our personal order codes and links to help you order easily. The products can be set up for Auto-Ship, if desired. Auto-Ship is a convenient option for the busy dog owner, since your order is shipped right to your door on the schedule of your choice. We personally appreciate the freedom and convenience of the Auto-Ship option. We absolutely love the NuVet Plus supplement and feel it has been a vital addition to our dogs’ health. We can’t say enough about the many benefits NuVet Plus has given our personal dogs and our extended Doodle family. The comprehensive list of ingredients is sure to give your puppy the added nutrition he needs for his growing body. Although we personally recommend Life’s Abundance dog food for a dry kibble option, we also understand that these aren’t the only dining options available for your dog. There are other dry dog foods available, and we know that you may opt to use one of these choices instead. No matter what food you select, we do recommend that you select a super premium dog food and a nutritional supplement for the life of your dog, not just when he is a puppy. We also recommend you seek out foods that DO NOT contain corn, soy, peas, or wheat as these are often used as fillers in dog food; They can be culprits of poor health, behavioral issues, and allergies in dogs. Always read the ingredients label! Not every expensive or premium dog food eliminates these ingredients. You can do more research about alternative food options at Dog Food Advisor. The Whole Dog Journal also does a comprehensive yearly comparison of available dog foods. No matter what you choose to feed, we do want to state that the use of a nutritional supplement like the NuVet plus should be an integral part of your dog’s nutrition. Dry dog foods especially need a supplement to be fully complete because the cooking process removes or kills many of the most beneficial nutrients, so a supplement is key to replacing them. 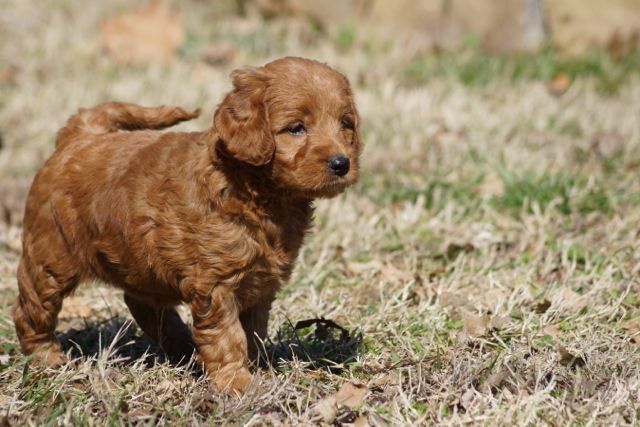 In addition, the use of probiotics can be helpful for keeping your young puppy’s immune and digestive system healthy. 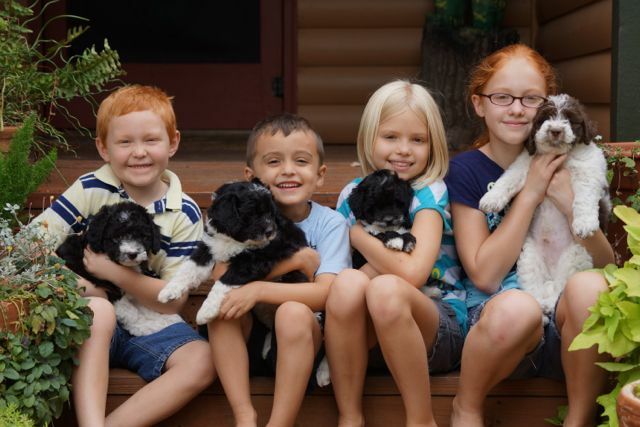 We suggest you give Doc Roys Probiotic or any probiotic each day for your puppy’s first month home. Safari Doodles is a participant in the Amazon Services LLC Associates Program, an affiliate advertising program designed to provide a means for sites to earn advertising fees by advertising and linking to Amazon.com.